Italy’s latest budget bill confirms that Renzi was never serious about challenging austerity. Italy’s latest budget bill – approved just a few days ago – confirms what many government critics have been saying all along: Matteo Renzi’s anti-austerity rhetoric is nothing more than that. Ever since his appointment as prime minister, in February 2014, Renzi has been an outspoken critic of austerity. Recent headlines – often accompanied by colourful accounts of epic behind-the-scenes clashes between Rome and Brussels (and/or Berlin) – include ‘Austerity only good for Germany, says Renzi’, ‘Renzi rips into Merkel over austerity’ and ‘Renzi attacks EU’s “therapeutic obstinacy” with austerity’. Following the recent earthquake in central Italy, Renzi pledged to ‘take whatever [budget flexibility] we need’ for his reconstruction plan, amidst expressions of support from various European leaders, including Angela Merkel (who said that Renzi would get a ‘sympathetic hearing’ over his plan). The post-earthquake solidarity was short-lived, though. A few weeks later, at the EU crisis summit in Bratislava, Renzi deserted the final press conference with his German and French counterparts because of disagreements over the economy and immigration. In the days leading up to the publication of the budget bill it became apparent that Renzi’s pleas for greater flexibility had fallen on deaf ears. First came Jens Weidmann, the infamous Bundesbank president, who accused Italy of ‘abusing’ the flexibility clause contained in the Stability and Growth Pact (SGP) and urged Renzi to focus on structural reforms and debt reduction. Then it was the turn of Pierre Moscovici, the European Commissioner for Economic and Financial Affairs, who stated that the SGP ‘works fine’ and ruled out granting further flexibility to Italy (even though he had just given Spain and Portugal reprieve from EU budget rules for running much higher deficits than Italy – twice as much in Spain’s case). Finally, Mario Draghi cut the dispute short by declaring that EU rules already provide for ‘a lot of flexibility’ and that ‘countries… should think more about the composition rather than the size of their budgets’ (despite his numerous calls in recent months for greater fiscal support to the ECB’s quantitative easing (QE) policies). The primary balance and the overall balance don’t always point in the same direction, of course: if a country has a high interest expenditure in relation to GDP, you can have a situation where the primary balance is in surplus (that is, the government earns more than it spends) but the overall balance is in deficit, because the primary balance is not sufficient to cover all interest payments, meaning that the country has to issue new debt simply to service its existing debt. This does not mean that Italy and the others should be praised for such budgetary policies. 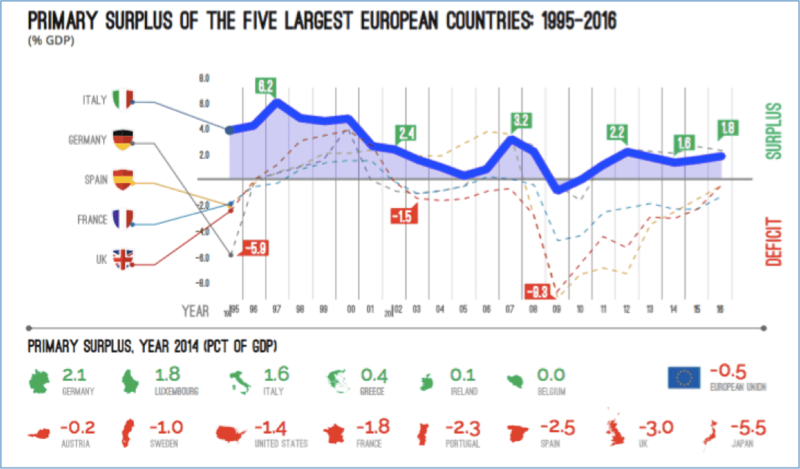 On the contrary, there is convincing evidence that such restrictive budgetary policies – pursued since the early 1990s by all EMU countries to meet the Maastricht convergence criteria – are one of the leading causes of the stagnant growth rates over that period. That is certainly the case for Italy. But it does put to shame the EU’s post-crisis mantra that European countries need(ed) to ‘put their fiscal house in order’. It also shows that the purpose (or at least, one purpose) of the post-crisis austerity policies was never to help the troubled countries of the eurozone, but simply to re-establish their debt-servicing capacity. The cuts and tax hikes did not make European governments any richer, or their public finances any more sustainable (quite the contrary, in fact, given the well-documented recessionary effects of these policies); the money ‘saved’ by cutting back on crucial public services went straight into the pockets of the creditors. Finally, it shows how surreal the whole European debate over ‘flexibility’ is: what is at stake is not whether governments should be allowed to run higher primary deficits, but how fast they should increase their primary surpluses. 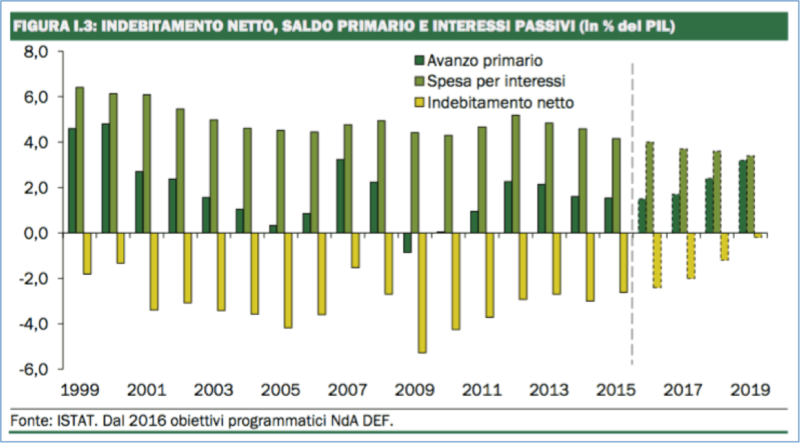 Coming back to Italy’s latest budget bill: its contractionary nature is confirmed by the estimated rise in the primary surplus, from 1.5 to 1.7 per cent in 2017. This is bound to further depress the Italian economy, as the government knows perfectly well. None other than the country’s finance minister, Pier Carlo Padoan, acknowledged in a recent interview with the daily Il Messaggero that ‘the reduction of public expenditure in Italy has led to lower growth rates than other countries’. What’s worse, though, is the fact that this further fiscal tightening will take place despite an estimated reduction in the country’s interest expenditure over the 2015-2017 period of around 2 per cent of GDP, thanks to the ECB’s ultra-low interest rate policies. 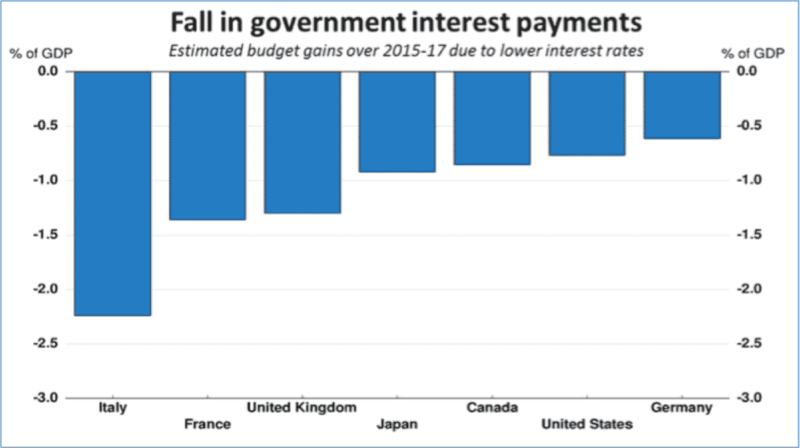 So much for the ‘fiscal space’ that QE was supposed to free up for governments; at best one could argue that austerity would have been even greater without it. But this latest development should not come as a surprise. Despite the prime minister’s bombastic anti-austerity rhetoric, the truth is that since he came to power Italy’s primary balance has been constantly rising and the overall balance constantly decreasing. Something that the country’s disastrous economic performance in recent years shows all too well. Therefore one can only conclude that either: (a) Renzi never had any intention of seriously challenging austerity, which would make him the greatest snake oil salesman since Berlusconi; or (b) his idea of challenging austerity is to constantly denounce the rules while making a point of being the only government in Europe to follow them, possibly in a perverse attempt to prove their uselessness by committing economic harakiri. Either way, Italy is firmly on course for a second lost decade as a result of Renzi’s abysmal policies.